We are having a very serious problem with mailbox vandalism in our community. 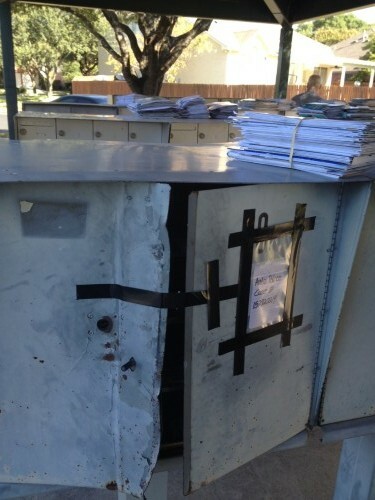 In the past few weeks at least 9 mailbox and parcel boxes have been forcibly opened. The last one happened at the pool at 10:10 PM on 10/18/15. We captured the thiefs on video. From start to completion they took 4 minutes. A total of three mailboxes were vandalized including one outgoing box. A significant percentage of our neighbors rarely retrieve mail from their mail or parcel boxes. Please retrieve your mail often. If there is not mail to steal there is not an incentive to keep coming back to break into more boxes. If you see suspicious activity report to the police immediately. If you have any additional information concerning the Scofield Farm thefts, please contact our office. I apologize for the inconvenience this event has caused.